49002 8 oz. 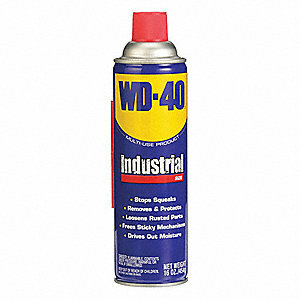 WD-40 Details Get effective lubrication right where you need it every time with the WD-40 8 oz. Smart Straw can! The recognizable red WD-40 straw is securely attached to the nozzle so you don't lose it. Flip the straw up to direct a precision stream onto small areas, or flip the straw down for a wider regular spray! WD-40 has over 2,000 listed uses including quieting squeaky doors and drawers, lubricating moving parts, loosening stuck bolts, removing grease, paint, gum, and even getting crayon marks off of walls.